The flag of the Ministry of Internal Affairs (website) is vertically divided blue-white-blue with the Ministry's badge in the middle (photo, photo, photo, photo). 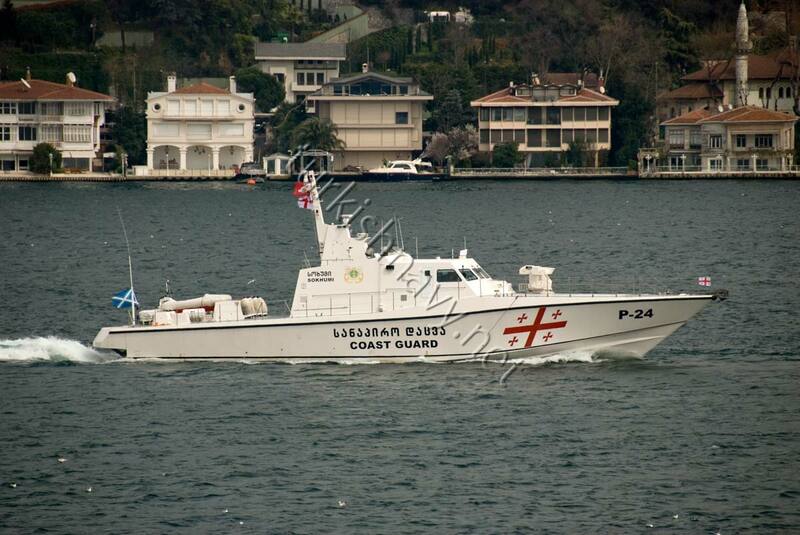 The flag of the Border Police is prescribed by Decree No. 507, signed on 25 August 1999 by President E. Shevardnadze. 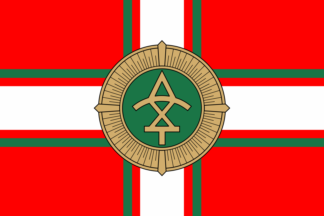 The flag (image) is red with a white cross and the emblem of the Police in the center. The ideogram, known since 1st-2nd century, is featured on ancient Georgian coins and border stones, now kept in the Georgian State Museum. The ideogram is encircled with 52 sunbeams, symbolizing the 52 weeks of the year. 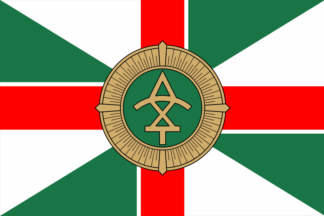 The Coast Guard ensign is similar to the ensign of the Russian Coast Guard, but with the order of the colours rearranged. The Coast Guard flag is in 2 X 3 proportions. In the center of the blue field is a white saltire (St. Andrew's cross, for the patron saint of sailors), whose width is 1/5 of the flag's hoist. A green (the Border Poilce's colour) fimbriation, whose width is 1/5 the white cross' width is separated from the white cross by the same distance. 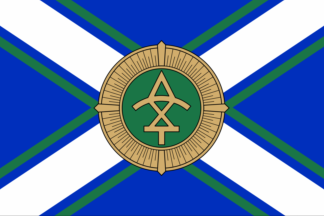 The flag is charged in the center with the emblem of the Border Police. The battle flag (photo) has no emblem.